BAGHDAD - Al Qaeda's chief has called on Muslims from other countries to support rebels in Syria seeking to overthrow President Bashar Assad, saying they cannot depend on the West for help. Ayman al-Zawahri, in a videotaped statement released late Saturday, asked Muslims in Iraq, Jordan, Lebanon and Turkey to join the uprising against Assad's "pernicious, cancerous regime." All four states border Syria. A senior Iraqi security official also told the Associated Press on Saturday that intelligence over the last four months has revealed a flow of al Qaeda-linked fighters from the northern Iraqi city of Mosul into Syria. The comments by both the Iraqi official and al-Zawahri came a day after two suicide car bombers struck security compounds in Aleppo, a Syrian city that had been relatively peaceful throughout the country's 11-month-uprising. Though there was no claim of responsibility, suicide bombings are a hallmark of al Qaeda. "There is no treatment for (the Assad regime) other than removal," al-Zawahri says in the eight-minute video posted on jihadist websites, according to U.S.-based SITE Intel Group, which monitors militant messages. He urged Syrians to oppose help from the Arab League and "its corrupt agent governments." The League has put forth a plan to try to end violence in Syria but it suspended an observers mission to the country after the regime flouted its agreement to the terms of the plan. 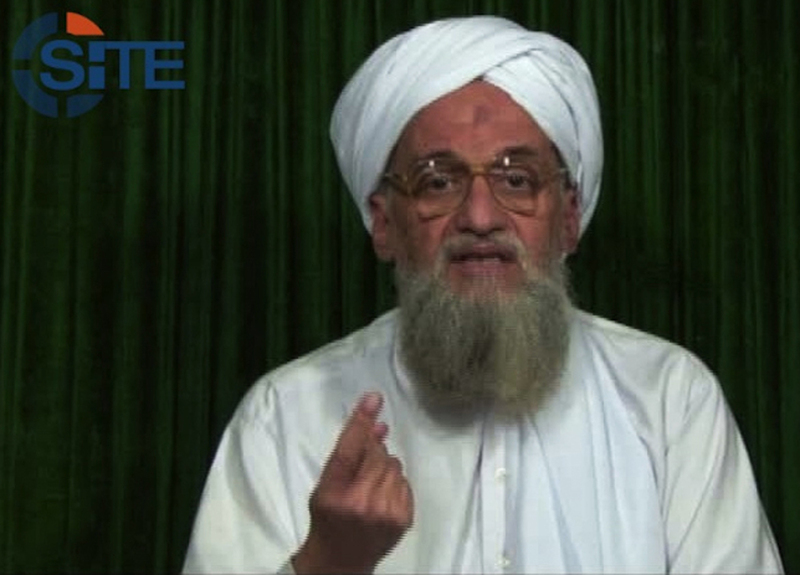 Egyptian-born al-Zawahri took over al Qaeda after Osama bin Laden was killed last May by a U.S. special forces raid on his hideout in Pakistan. The Iraqi official said at least two Syrian suicide bombers who trained in Mosul have crossed the border to join the fight in Syria. Fighters armed with guns and explosives also have headed from Iraq to Syria, said the official, who spoke on condition of anonymity because he was not authorized to publicly discuss intelligence. Al-Zawahri in the past clashed with al Qaeda in Iraq. Both he and bin Laden urged followers to focus attacks against U.S. and Israeli interests, and sharply condemned the network's Iraqi wing for targeting Shiite Muslims during the years that Iraq teetered on the brink of civil war. Al Qaeda fighters in Iraq generally have confined attacks to their home country.